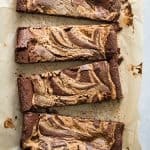 Chocolate Peanut Butter Brownies are so addictive you’ll never stop at just one! Top them with a scoop of your favorite ice cream for an out-of-control easy dessert. Things that come in two’s are usually made for each other. That’s why chocolate and peanut butter are such best friends and chocolate peanut butter brownies are the bomb! When my friend Irvin Lin from Eat The Love sent me a copy of his book, Marbled, Swirled and Layered It took me a while to decide on what to make. Irvin can bake and the recipes he chose to fill this book shows exactly that. It was a toss up between these chocolate peanut butter brownies, made with a variation of his base brownie recipe, and his Rosemary Caramel and Dark Chocolate Potato Chip Tart. I know, chips in a tart sound ridiculously good but it was the rosemary that caught my attention. There’s something amazing happens when you add fresh herbs to deserts, especially rosemary! But the old faithful won this time. Chocolate and peanut butter are the perfect pair and these brownies are heavy on the peanut butter which I sold it for me. 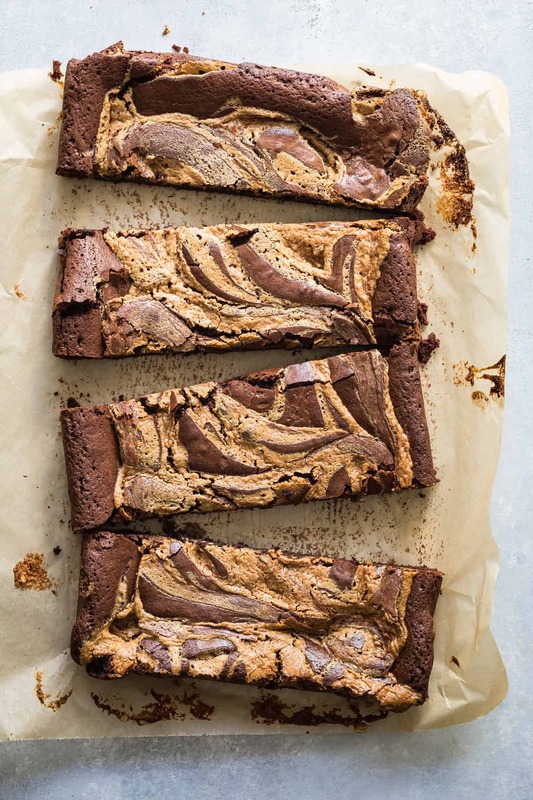 Marbled, Swirled and Layered is the book to have on your shelf if you love to bake. The recipes are manageable and there’s one for every occasion and season of the year. If you love to bake, ask someone to buy you this book, and then make them something. It’s a total win-win for everyone. Have the best Easter weekend everyone. I’ll be semi-vacationing in L.A. so keep an eye on my Instagram stories for good eats and lots of pool based cocktails! Irvin provided a book for me to review, all opinions are my own! 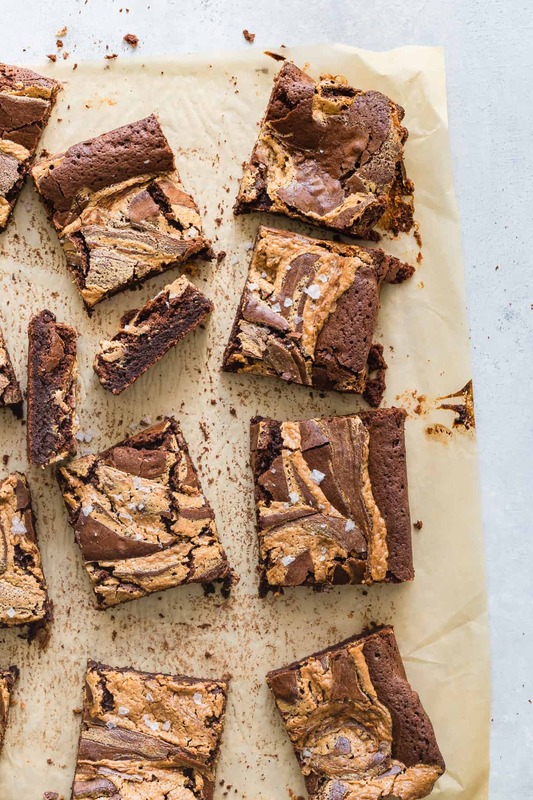 These moist Chocolate Peanut Butter Brownies are so addictive you'll never stop at just one! Top them with a scoop of your favorite ice cream for an out-of-control easy dessert. Preheat the oven to 350 degrees F. Line a 13 x 9 inch baking pan with parchment paper with a slight overhang. Melt the chocolate and the butter together in the microwave in a large bowl. Add both of the sugars and whisk until well combined. Add the eggs one at a time and whisk vigorously until smooth, then add the vanilla, salt and baking soda. Mix well. Using a large spatula fold in the flour and cocoa powder until smooth. Pour half of the brownie batter into the prepared pan and spread out evenly. Drop dollops of half of the peanut butter mixture on top. Add the remaining brownie batter spreading it out. Drop the remaining peanut butter on top and with a butter knife start to swirl the mixture together. Bake in the oven for 35-40 minutes or a toothpick comes out clean. Let cool before slicing and sprinkle with some sea salt if desired. 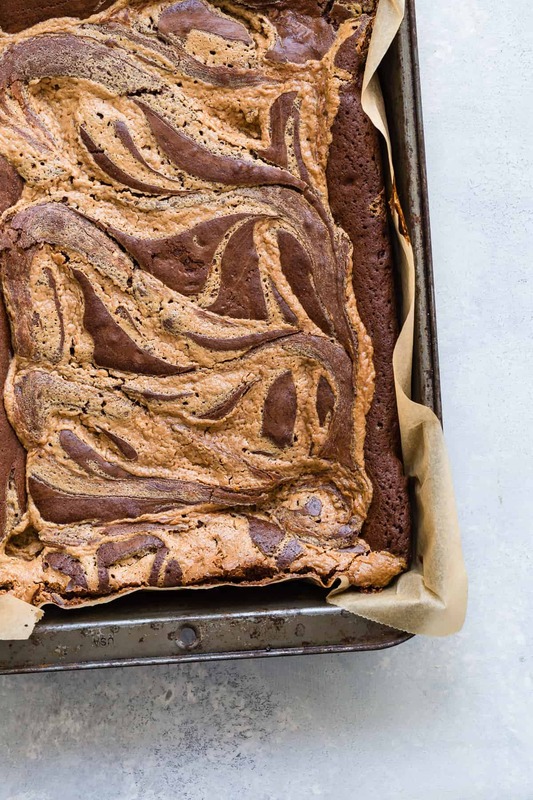 Those peanut butter swirls are everything – love these brownies!